As someone not into “action films” and not familiar with the Mad Max franchise, I, at first, wasn’t sure if I would go see this film. Then, after becoming a bit more familiar through my friend’s post, I decided to go. The names Charlize Theron (and Tom Hardy—please see Locke—it also involves a road) also had something to do with my decision, as well as a trailer (that I’d seen many times at the movies) so fast and intense that I was left breathless; I had to have been paying enough attention to it in order for it to leave me breathless. I am glad I saw Mad Max: Fury Road and did not lump it into the “action” category in my mind. I will, however, continue to avoid those action films that portray women as objects and “prizes” to be won by the male leads who are defined by their fancy cars, money, nice homes, nice clothes, and, well, male privilege. Unfortunately, they’ll continue to make plenty of money without my support. 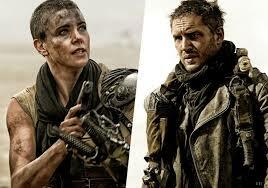 Fortunately, there are movies like Fury Road to give us something, within the genre, more authentic to watch. Everything happens on the road—birth; death; a relationship involving a balanced exchange of support between a man and a woman, not defined by gender roles; falling in love; “car” trouble; teamwork; bitter struggles between opposing ideologies; nostalgia; letting go of the past; facing the future. . . . There is also a dangerous patriarchal society that should remind us of all the work needing to be done in real life. It is very nice to see Theron’s character in a role of power and at the same time see her need to rely on others at times, because one-dimensional representations of women who can only show strength and no vulnerability strip those characters of their humanity and leave even fewer examples of truthfulness in the culture. The same is true for Hardy’s character. He needs to be saved but also saves. I saw the relationship between the two as a positive one. I saw women represented as complex, which is something I hope to one day not have to point out because that would mean that there has been an important step toward seeing and presenting reality for what it is.